For #DietDH week 2 the readings and related websites explore the language used toward defining online archives, editions, collections, and projects. In his essay, Kenneth M. Price investigates the terms edition, project, database, archive, and thematic research collection with the Walt Whitman Archive. In his investigation in explaining digital scholarship with the use of these terms, he argues how they are defined can either clarify or obscure the context. I have chosen the term project for this blog post, because the examples in Price’s essay are perceived by traditional and digital humanities aesthetics. The traditional humanities context was considered with the description toward receiving funding for the Walt Whitman Archive. The funding program defined the term to be something that wasn’t permanent or to become a finished idea. While the digital and Internet presences of the Walt Whitman “project” fit with the open ended characteristics of digital media – as in the project would evolve from future content. 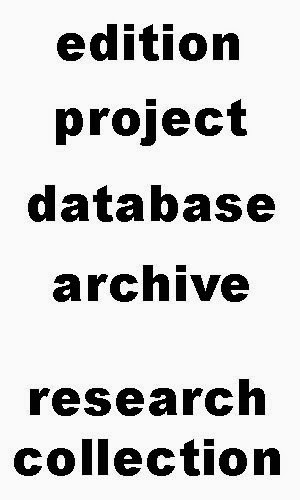 It is commonly known that archives do have an active use within scholarship, but the process of organizing a digital humanities project usually entails a team effort and digitalization of information or objects. This is why defining specific terms according to digital scholarship research could aid in the understanding of the foundations of the project. At the end of his essay, Price does acknowledge that not limiting the text to the current definitions can lead to the evolution of new terms for digital humanities. I do question if there will be universal terms for digital scholarship, because of the diverse backgrounds of scholars and the traditional context to disciplines that are still being taught currently. In addition, this would create a bland Internet surfing experience. The reading provided a literary example and I wanted to include a couple of examples that have aspects of visual and material culture, museum exhibition space, along with social economics. The two examples also implement their own definitions of Price’s terms. Dina Kelberman's Smoke and Fire Collection of found digital objects (gifs & animations) this collection is ongoing and is an online exhibition at the New Museum in New York City. John Freyer’s project, All my Life for Sale, explored the relationship of his personal objects and the Internet commerce of ebay, which created a collection of online sold objects.